I think it is funny the way people decide that they don’t like a certain food even before they ever have tried it. That includes me; I had it in my head that I didn’t like cooked spinach even though I had never had a bite of cooked spinach in my life. Well since my blogging days I have changed my ways, I have found that cooked spinach is wonderful in different things that I have made. I have to say that I am amazed how delicious it tastes in soups and chicken dishes that I have used it in. 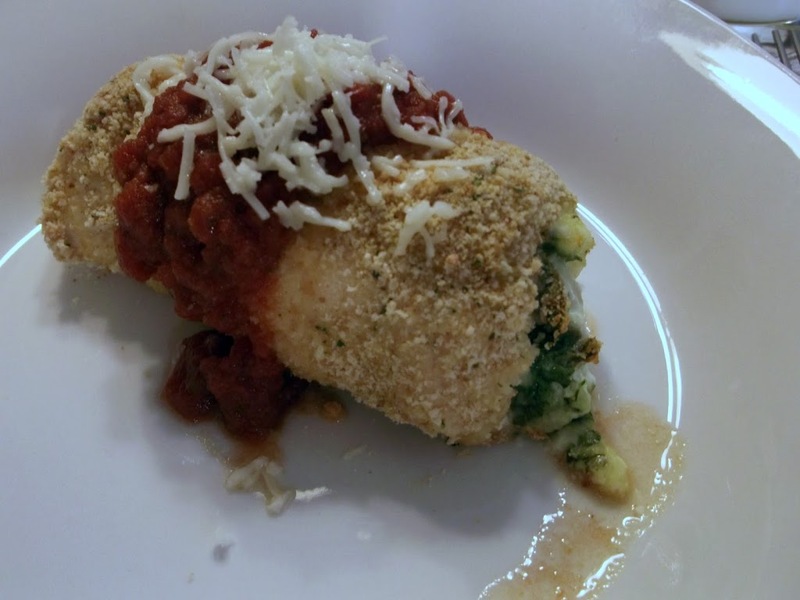 My latest recipe that I used spinach in was called Chicken Parmesan Bundles. I found this recipe in the fall of 2007 Kraft Food & Family magazine. I did adapt it a little to what I had in the house and it turned out to be really an amazing dish. 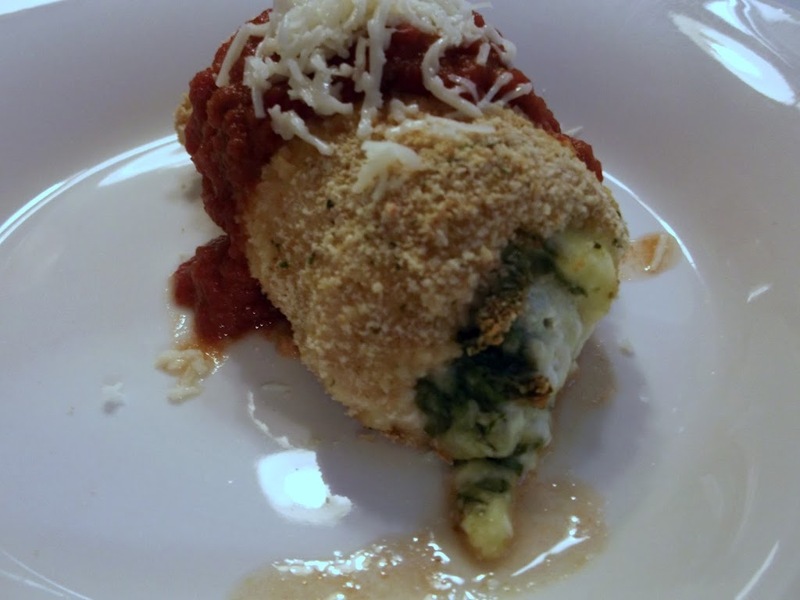 The chicken is filled with 3 kinds of cheese along with spinach, then rolled in bread crumbs, and then popped in the oven to bake until the cheese is gooey and the chicken is nice and tender. When served it is topped with spaghetti sauce and even more cheese. Now really it can’t get much better than this. Mike, our daughters, and I loved this dish. It is easy and quite quick to make. If you have not tried cooked spinach just because you don’t think you will like it I would encourage you to try it, you may fall in love with it like I have. Preheat oven to 350 degrees F. Mix cream cheese, spinach, 1 cup of the mozzarella cheese and 3 tablespoons of the Parmesan cheese until well blended; put about a tablespoon of the mixture on each chicken breast. Bring both ends of the chicken together and secure with a tooth pick. Set aside. Beat egg in a shallow bowl or pie plate. Mix remaining 3 tablespoons Parmesan cheese and bread crumbs in separate shallow bowl or pie plate. Dip chicken bundles in egg and then roll in the bread crumbs. Remove toothpick and place seam side down, in a 13×9 inch baking dish lined with tin foil and sprayed with cooking spray. Bake 30 minutes or until chicken is cooked through (165 degrees F). Serve topped with the spaghetti sauce and the remaining 1/4 cup of Mozzarella cheese. 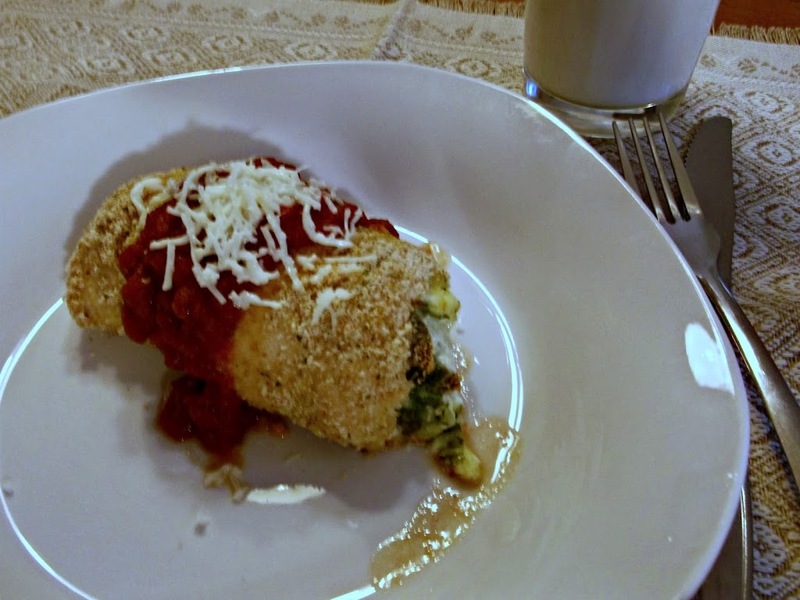 (Note: If preferred the spinach mixture can be spread on the chicken breast and rolled up. I found it easier to put the mixture in the middle of the breast and fold the end over top of the mixture). What a great idea! They look so delicious. I actually crave cooked spinach quite a bit. Great idea to use it as filling!